In my last post, I announced that I’m going to read 52 books this year. Seems like a paltry goal compared to some of you. I’ll do my best! So, by request, here’s my unfinished book list in alphabetical order by title. My writer group friends suggested that I dump all these since I didn’t finish them, but I can’t. Some I just started reading in December. Others got put down because of distractions that had nothing to do with the quality of the stories. Don’t judge. That’s 47 out of 52 slots. I’m sure if I organize my bookshelves better, I’ll find a few more that I haven’t read yet. 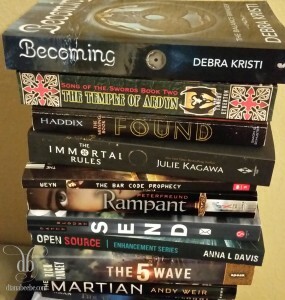 Even as I write this, I’m remembering a few that I acquired at RWA Nationals 2014. *hangs head* Now I need to update my list on Goodreads. What other fiction books should I add? Have you followed my blog yet? (Eventually, I’ll send out a newsletter, too.) I’ll never share your email address!